Top to bottom, headliners to carpet, we do it all. We can repair small burns and tears as well as huge gashes and water damage. We highly encourage you to fix even minimal damage before it expands. 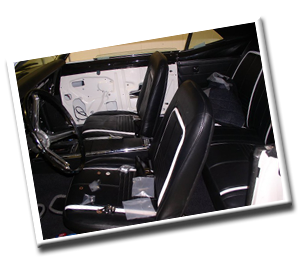 Whether you had a screwdriver in your pocket and sat down in your brand new car, or you have a 1967 Camaro that needs refurbishing: big, small, old, new, we do it all. Even if you don’t know where the problem is, as is so often the case with water damage, we can help! Of course we can fix your carpet (and if we can’t we will find someone who can). Drying out carpet damage correctly is extremely important, but preventing it from happening again is equally necessary. Often it’s hard to pinpoint the source of the leak; we can. We can diagnose the problem, trace a leak to its source, and then repair it, so you can hop the next bus out of floodsville and never look back.